Introduction: The high protein value, essential minerals, dietary fibre and notable ability to fix atmospheric nitrogen make chickpea a highly remunerative crop, particularly in low-input food production systems. Of the variety of constraints challenging chickpea productivity worldwide, salinity remains of prime concern owing to the intrinsic sensitivity of the crop. In view of the projected expansion of chickpea into arable and salt-stressed land by 2050, increasing attention is being placed on improving the salt tolerance of this crop. Considerable effort is currently underway to address salinity stress and substantial breeding progress is being made despite the seemingly highly-complex and environment- dependent nature of the tolerance trait. Conclusion: This review aims to provide a holistic view of recent advances in breeding chickpea for salt tolerance. Initially, we focus on the identification of novel genetic resources for salt tolerance via extensive germplasm screening. We then expand on the use of genome-wide and cost-effective techniques to gain new insights into the genetic control of salt tolerance, including the responsive genes/QTL(s), gene(s) networks/cross talk and intricate signalling cascades. Keywords: Chickpea, DNA markers, Genomics, Molecular breeding, RNA-Seq, Salinity, Tolerance, Transcript, QTL. Keywords:Chickpea, DNA markers, Genomics, Molecular breeding, RNA-Seq, Salinity, Tolerance, Transcript, QTL. Abstract:Introduction: The high protein value, essential minerals, dietary fibre and notable ability to fix atmospheric nitrogen make chickpea a highly remunerative crop, particularly in low-input food production systems. Of the variety of constraints challenging chickpea productivity worldwide, salinity remains of prime concern owing to the intrinsic sensitivity of the crop. In view of the projected expansion of chickpea into arable and salt-stressed land by 2050, increasing attention is being placed on improving the salt tolerance of this crop. 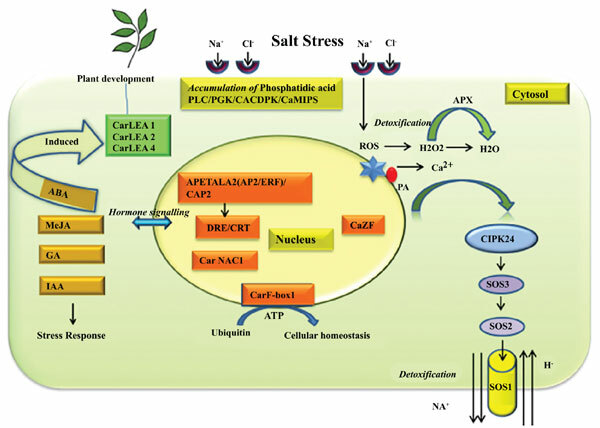 Considerable effort is currently underway to address salinity stress and substantial breeding progress is being made despite the seemingly highly-complex and environment- dependent nature of the tolerance trait.